The Hera Research Newsletter (HRN) is pleased to present an eye opening interview with James G. Rickards, Senior Managing Director of Tangent Capital Partners, a merchant bank specializing in alternative asset management solutions, and also Chief Operating Officer of Oro Capital Advisors, LLC, a commercial real estate advisory firm and Tangent Capital affiliate. He is a counselor, economist and investment advisor with 35 years experience in global capital markets. Mr. Rickards has held senior executive positions at Citibank, RBS, Long-Term Capital Management and Caxton Associates. In 1998, he was the principal negotiator of the rescue of LTCM sponsored by the Federal Reserve Bank of New York. His clients include private funds, investment banks and government directorates in national security and he is an advisor on global capital markets to the U.S. Office of the Director of National Intelligence. He is a frequent speaker at conferences on derivatives and hedge funds and is active in the International Bar Association. He has been interviewed in The Wall Street Journal and the Economist, has appeared on CNBC, Fox, CNN, BBC and NPR and is an Op-Ed contributor to the Financial Times, New York Times and the Washington Post. Mr. Rickards, who is a visiting lecturer at the Kellogg School and the School of Advanced International Studies, has delivered papers on econophysics at the Applied Physics Laboratory and the Los Alamos National Laboratory and has written articles on cognitive diversity, network science and risk management. Mr. Rickards holds an LL.M. (Taxation) from the New York University School of Law; a J.D. from the University of Pennsylvania Law School; an M.A. in international economics from the School of Advanced International Studies and a B.A. (with honors) from The Johns Hopkins University. Hera Research Newsletter (HRN): Thank you for taking the time to speak with us today. Let’s talk about the Federal Reserve’s quantitative easing program (QE2). Is there a risk of price inflation? Jim Rickards: I think there is a definite and highly significant danger of inflation coming from QE and QE2 specifically. A lot of people have said, in fact, the Fed has said, that, if you look at the key price indices, the Producer Price Index (PPI), Consumer Price Index (CPI), and the Personal Consumption (PC) price deflator, they are very, they use the phrase, “well behaved”. For the past year and a half, the critics, and I would include myself, have been saying that this situation is dangerous and unstable. The Fed has been pointing to the price indices and saying that you can’t find inflation under a rock, you can’t find inflation with a microscope, so what are you worried about? HRN: Why do you think the situation is unstable? Jim Rickards: There is a lot of inflation, but it is being offset by deflation. I compare it to an arm wrestling match. If you’ve ever seen an arm wrestling match with two really powerful participants, nothing really happens for a long time. The two arms just kind of sit there, then all of a sudden it starts to tip, then one guy just breaks and his arm is slammed down on the table. Just because nothing is happening at the surface doesn’t mean that a lot of things aren’t happening below the surface. In a depression, such as the one that began in 2007, you have very, very strong deflationary forces. I call it a natural deflation that’s being offset by policy inflation. So the fact that the price indices are around zero doesn’t mean that they’re well behaved, it just means that they’re masking the two tectonic forces that are pushing against each other. HRN: Do you think deflation will win, or will it be inflation? Jim Rickards: For the past year and a half, I’ve wondered which way it’s going to tip. If I’m right about those two forces, one of them is going to prevail at the end of the day and, on which one it’s going to be, I really reserve judgment because I could argue it both ways. I am now coming down on the side of inflation because the inflation is becoming very, very apparent. So, the first thing is that the well behaved indices are masking more than they’re telling us because, below the surface, there are powerful deflationary and inflationary forces fighting each other. HRN: Why do you think inflation will win? Jim Rickards: It’s been known since the 1950’s, as Milton Friedman pointed out, inflationary effects occur with the lag. The fact that you saw QE in 2009 and inflation didn’t show up until the end of 2010 really should not give you a lot of comfort because an 18 to 24 month lag is normal and would be expected. Sure enough, right on schedule, 18 months after QE1 was announced in mid-2009 we’re starting to see the inflation. HRN: What does inflation in foreign countries have to with QE2? Jim Rickards: There are some new forces in play since Friedman did his seminal work and, of course, it’s the result of globalization. What has been happening is that what would otherwise have been U.S. inflation is showing up in China and Taiwan and Korea and places like that because of the exchange rate mechanism. I put this under the heading of currency wars. In effect, China has been importing all of our inflation through the peg between the dollar and the yuan. HRN: How does the yuan-dollar currency peg cause inflation in China? Jim Rickards: Just think about the mechanics of it. There’s a lot of deleveraging going on, which is where the deflation comes from, so the Fed goes out and prints a whole bunch of dollars and spreads them around. Americans take a lot of those newly printed dollars and buy foreign goods so the dollars go to China, but China doesn’t want the yuan to appreciate because they want to maintain the peg, or at least they have until very recently. So, what do they do? They have to buy up the dollars. Well, in order to buy up the dollars they have to print yuan and basically give the yuan to the exporters in exchange for the dollars. Well, that’s basically flooding China with yuan and so the Fed’s printing press was being sterilized in America by the Chinese who were flooding their own country with their own local currency. So, through the exchange rate mechanism, and through the peg between the dollar and the yuan, our inflation was showing up in China and now it’s showing up in Vietnam, South Korea, Taiwan and other places. HRN: Can the U.S. keep exporting its inflation? Jim Rickards: Like I said, inflation in the U.S. was being offset by natural deflation and there is a time lag before inflation shows up. It has taken a while for inflation to show up in China because they also had a lag. U.S. inflation was being exported through the currency exchange rate mechanism, but all good things come to an end. These things are now coming to an end for two specific reasons. Number one, the time lag just works its way through, and I think commodity prices, input prices, are where the inflation is really starting to show up and it will work its way through the supply chain and eventually show up in retail. Number two, the Chinese have now thrown in the towel on the appreciation or revaluation of the yuan and the reason for that is inflation. HRN: So, the Chinese yuan will rise versus the U.S. dollar? Jim Rickards: Inflation is just another form of revaluation. What do you do when you revalue your currency? Well, you increase your cost structure relative to other countries. You make your goods more expensive from the view of a U.S. purchaser, let’s say. Well, inflation does the same thing, inflation increases your cost structure. So, inflation and revaluation are the same thing economically with one very important difference; revaluation you can control, but inflation very quickly gets out of control. The Chinese, once they saw the inflation, said, well, look, this is going to happen anyway, our cost structure is going up and there’s nothing we can do about it. Our choice is between control and lack of control and, of course, they’re control freaks, so they’re going to go with control, which means they’re going to go with the revaluation and try to stay ahead of the inflation. HRN: Do the Chinese have any other option? Jim Rickards: They thought they had an ability to keep a lid on their domestic inflation through price controls. We all know that price controls always ultimately fail, but they can work in the short run, especially if you have a more coercive society and I would put China in that category. Whether there was going to be a black market or offshore money or the inability to enforce their rules at the local level, I think they quickly realized price controls were a losing battle. HRN: What about other export nations, like Brazil? Jim Rickards: The Fed is flooding the world with dollars and, as former U.S. Treasury Secretary John Connally famously said in the 1970’s, “it may be our currency, but it’s your problem”. Raising interest rates, currency debasement and capital controls are all tools in the toolbox that exporters can use to deal with Fed monetary policy and QE2. We’re seeing capital controls in Brazil, for example. Brazil couldn’t really control the appreciation of the real, there was just too much demand, too much hot money flowing into emerging markets, Brazil in particular. So there wasn’t much they could do about it from a currency point of view, so they’re putting in capital controls. The next step down that road, you pretty quickly go from currency wars to trade wars and trade wars lead to tariffs and then export quotas. We’re seeing a little bit of that in China with rare earth elements (REEs), although there’s another agenda with respect to REEs having to do with encouraging manufacturers to put their plants in China so they can get guaranteed access to the REEs. HRN: Will the revaluation of the yuan and capital controls in other countries cause prices to rise in the U.S.? Jim Rickards: The inflationary chickens are coming home to roost in the United States. Once the Chinese throw in the towel and revalue the yuan, all of that inflation that Bernanke has been trying to get, but which has been going to China, etc. will show up in the U.S. I think, we’re looking at significant inflationary forces, for all of the reasons I just mentioned, and that’s probably going to be the story of 2011. HRN: So, the Federal Reserve caused inflation in Asia, South America and elsewhere resulting in currency wars and now there’s a risk of trade wars? HRN: If the U.S. economy is recovering, why doesn’t the Federal Reserve stop QE2? Jim Rickards: When you see data that point in a positive direction, you have to take a step back and say, OK, objectively, the data points in a positive direction but how much of that is policy induced and how much of that is self sustaining? My view is that almost all of it is policy induced and very little of it is self sustaining. I reach that conclusion by looking at data where, if we were in a self sustaining recovery, other things would be getting better and they’re not, such as unemployment. That suggests to me that it’s not a self sustaining recovery, therefore, I conclude that it’s mostly policy induced, which means the Fed is going to have to keep going. HRN: Can inflation help the U.S. economy to grow and help to reduce unemployment? Jim Rickards: The main reason the Fed wants inflation has very little to do with growth and everything to do with the debt overhang and the fragility of the banking system. People forget that the Fed exists to help the banks. It’s the whole reason for the Fed. HRN: Isn’t the purpose of the Federal Reserve to promote price stability and full employment? Jim Rickards: The Fed was created by banks and it exists to prop up the banking system. The idea that it’s somehow a benign moderator of economic conditions, in my view, is nonsense. The Fed is first and foremost a device to prop up banks and, right now, the biggest problem in the banks is their bad assets. HRN: Didn’t the bailouts and the Federal Reserve’s purchases of mortgage-backed securities clean up the bad assets? Jim Rickards: The bad assets haven’t gone anywhere. They were identified in 2007, but they had been there all along. The bad loans were made in 2004, 2005 and 2006 because Greenspan and the Fed’s Board of Governors kept interest rates too low too long, so that’s when the bad loans were made. They were identified as such in 2007 and then we had the panic of 2008, but what’s important to understand is that the bad loans haven’t gone anywhere. It’s not as if they’ve been magically transformed into good loans, it’s not as if they’ve been marked down, it’s not as if they’ve moved from weak hands to strong hands. What’s happened is, they’ve basically been locked in amber, frozen on the balance sheets of the banks. HRN: So, the Federal Reserve wants inflation to help banks that made bad loans? Jim Rickards: The Fed is hoping for a couple of things. First of all, they’re hoping that inflation comes back so that, at least, the nominal values get back somewhere closer to where the loans were originated. Of course, the real value has all been eroded, but who cares? If you’re a bank, you just want that nominal value so you don’t have to take the loss and the hit to capital. Second, they’re hoping that, because of the steepness of the yield curve, the banks could eventually earn their way out of the problem and make provisions for the bad loans. Obviously, they’re going to the zero interest rate policy and so, with those two things in mind, the Fed wants the inflation to come and help the banks and give them time to recover. HRN: Wouldn’t inflation also reduce the real value of the U.S. federal government’s debt? Jim Rickards: The United States has well over $100 trillion in obligations. Now, that’s not all bonded debt, the actual debt is significantly less than that, but when you throw in contingent obligation arising from Social Security, Medicare, Medicaid, Fannie Mae, Freddie Mac, Federal Housing Authority (FHA), Federal Home Loan Bank, student loans, etc., etc. The point is, you can just go on and on with these obligations. The number is well north of $100 trillion. Now, it’s not all due and payable in the next couple of years, these are 20 year obligations, but then you have to say where are we going to get growth for the next 20 years to meet these obligations? That’s very hard to see. HRN: So, the U.S. economy can’t grow its way out of debt? Jim Rickards: I don’t see any feasible combination of growth and taxes that will generate enough income to pay off the debt. People warn about the debt trap, to me it’s already too late. We’ve already fallen into a hole where, mathematically, it’s impossible to earn enough to pay off the debt. The debt is compounding faster than growth is being generated and raising taxes is not a solution because that will kill growth, so you just can’t get there. HRN: What can the U.S. federal government do about its debt? Jim Rickards: There are two ways to deal with the debt. One is to just default; I just won’t pay you. The other one, of course, is the one that governments prefer which is inflation. You say, OK, here’s your trillion dollars and good luck buying a loaf of bread with it; it’s just not going to be worth very much. So, that’s what we’re doing and that’s another reason why Bernanke wants inflation. Of course, he doesn’t want hyperinflation, he doesn’t want 10%, but he doesn’t need 10%. If you do 4% a year for 17 years, you cut the value of the debt in half. So, that $100 trillion figure I referred to, in real terms, becomes something more like $50 trillion, which is still a big number, but much more manageable than $100 trillion. He says he wants 2% or slightly less. I think that’s disingenuous, I think what he would like is something more like 3% or 4% where, over a 15 to 20 year period, you could really reduce the value of the debt in real terms very significantly. HRN: If the U.S. is debasing the dollar, why is there strong demand for U.S. Treasuries? Jim Rickards: The reason the Treasury auctions are going well is because the Fed is buying. Think about what quantitative easing really is. The amount of quantitative easing over the 6 month period from November to June is approximately equal to the federal deficit. In other words, the federal deficit is running about $1.4 trillion a year, so half of it would be $700 billion and the Fed is out to buy $600 billion. By the way, I don’t think it’s going to end in June and they never said it was going to end in June. What they said was, we propose to buy $600 billion of treasury obligations between November and June, but they never said it was capped at $600 billion. They just said we’re going to buy about $75 billion a month for the next 6 months. I don’t think they will stop there. I view this as much more likely to be a trillion dollar plus program, not $600 billion. HRN: How does the Federal Reserve’s purchase of U.S. Treasuries in the open market monetize U.S. government debt? Jim Rickards: These things are pretty fungible. Dollars are totally fungible and Treasury securities are quasi fungible because it’s the same credit in the same currency. So, imagine you’re an institutional investor and you’re holding an off-the-run 7 year note with 5 years to maturity and the government is issuing a new 5 year note. Obviously, the primary dealers mediate this and are the interface between the Fed and the institutional investor. So, the Fed goes out and buys an off-the-run 7 year note from an insurance company, let’s say, and the insurance company replaces that in their portfolio by buying a new 5 year note. From the insurance company’s point of view, they got rid of a 5 year treasury and they bought a 5 year treasury, so nothing happened. From the Fed’s point of view, they bought the 5 year treasury with newly printed money and so there’s some intermediation and there’s multiple parties involved, but the net effect is exactly as if the Fed was monetizing the new debt. HRN: Let’s get back to inflation. Can’t the Federal Reserve control inflation if prices start rising? Jim Rickards: I think these processes are dynamically unstable and once you let the inflation genie out of the bottle, you don’t get 2% or 3%, you go straight to 10% and that’s what happened in the 1970’s. If you look at the late 60’s and early 70’s, inflation was 1% or 2% and then one year it pumped up to 3% and they said, oh my goodness, it’s 3%. After that, it went to 5%, then to 8%, then to 10% and then to 13%. In other words, between 1977 and 1981, in that five year period, cumulative inflation was 50%. The value of the dollar was cut in half over that very short 5-year period of time. So, that’s how it accelerates and gets out of control. I think that’s what’s going to happen again. HRN: How much will prices go up in the U.S.? 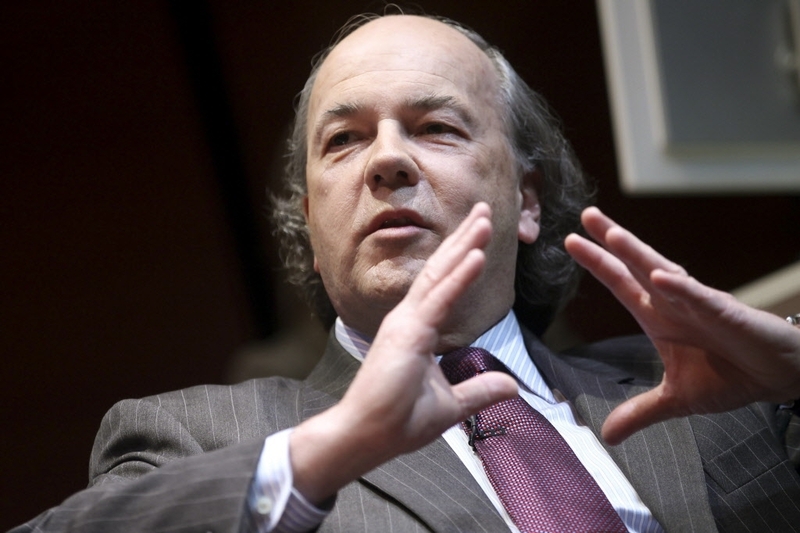 Jim Rickards: Bernanke says 2%, but he actually wants something closer to 4%. I think what he’s going to find is that it goes very quickly to 8% or 9% or 10%, which is borderline hyperinflationary and that’s going to be a huge problem. It’s going to be a shock that the American people are not ready for. HRN: What can the Federal Reserve do if price inflation starts to accelerate? Jim Rickards: Well, Bernanke says, oh, don’t worry about high inflation because we have the ways and means of controlling that. If you take Bernanke at his word, which I don’t totally do, but if you do take Bernanke at his word and he says I want 2% and inflation goes to, let’s say, 3% or 4%, he’s saying, well, we can dial it back down to 2%. Well, how are you going to do that? One way is by raising interest rates, but are you really going to raise interest rates when unemployment is close to 10%? Bernanke says he can raise rates, and legally he can, but he’s not actually, politically or economically, going to be able to do it because he’ll be raising interest rates in the face of the greatest sustained period of high unemployment since the Great Depression. So, it’s just not going to be politically possible. HRN: Couldn’t the Federal Reserve remove liquidity from financial markets to counter inflation? Jim Rickards: There’s another problem with QE2, which is that the Fed is probably insolvent today if you applied some rigorous mark-to-market tests and that will become more apparent as this process goes forward. Let’s just say Bernanke gets what he wants, and, all of a sudden, inflation starts to creep up and he says; OK, now we have to put on the brakes. Well, how do you do that? The way you do it is by reversing QE. In other words, QE is creating money to buy bonds. The way to reverse that is to sell bonds into the market and take the money out. Well, the problem is you’re going to have massive mark-to-market losses on those bonds. First of all, there’s the Bear Sterns junk and, remember, QE1 was not treasury securities, it was mortgage backed securities. They’re not going to be able to liquidate the bonds without going broke. HRN: How can the Federal Reserve go bankrupt? Jim Rickards: The Fed is on its way to a $3 trillion balance sheet. Their capital, in round numbers, is about $60 billion. With $3 trillion on the balance sheet and $60 billion of capital, they’re leveraged 50 to 1. That’s worse than Long-Term Capital Management when they got in trouble in 1998. If you’re leveraged 50 to 1 and you have a 2% decline in assets, just 2%, and the stock market sometimes moves 2% in a single day, you just wiped out your capital. A 2% hair cut on $3 trillion is $60 billion and that takes your capital to zero and the Fed is broke. HRN: Could the Federal Reserve’s primary dealers sell Treasuries to remove liquidity from the market and help keep inflation in check? Jim Rickards: The primary dealers can’t create money through auctions or open market operations. The primary dealers can buy and sell securities but they’re doing it with money that already exists whereas when the Fed buys securities or sells securities they are creating or destroying money. The primary dealers can prop up the market in government securities, but they can’t create money the way that the Fed does or make money disappear the way the Fed does. HRN: So, there’s nothing the Federal Reserve can do to control price inflation? Jim Rickards: They’ve got to be looking down the road and saying, gee, we say we can get inflation under control, but the tools that we have to do that will basically be raising interest rates with 10% unemployment, which is not going to happen, or selling bonds and going broke, which is not going to happen. So, it’s all talk. The Fed won’t actually be able to keep inflation under control and it’s going to very quickly fly out of control. HRN: Won’t rising prices make most Americans poorer? Jim Rickards: The Fed doesn’t care about that. The Fed doesn’t care about people. They don’t care about workers. They don’t care about wages. They say they do, but the Fed only cares about banks. HRN: Bernanke has been in the media, saying that inflation will stimulate the U.S. economy and help create jobs without causing prices to go up. Jim Rickards: It’s propaganda. I had a discussion with former Fed governor, no reason to mention the name, who is a very well known economist, and what he said was that behind closed doors the Federal Open Market Committee spends about 10% of their time on policy and 90% of their time on communication. They very quickly arrive at what they’re going to do and then spend the vast majority of their time thinking about messaging and wordsmithing. Well, there’s a name for that. It’s called propaganda. HRN: Thank you for sharing so many of your insights with us today. Jim Rickards: It’s my pleasure. Jim Rickards is one of the most astute intellectuals today in economics, financial markets and monetary systems, as well as an increasingly outspoken critic of the Federal Reserve’s monetary policies. The debasement of the U.S. dollar—the world reserve currency—through QE2, and due to monetary expansion resulting from low interest rates, is exporting U.S. inflation abroad, disrupting economies in Asia, South America and elsewhere. In addition to putting upward pressure on food prices globally, with potentially disastrous consequences, inflation is a hidden tax on savings and wages and, as prices rise, the living standards of most Americans will decline. Currency wars, caused by the Federal Reserve’s policies, could lead to trade wars or, in the worst case, to economic and political chaos as has been seen in Tunisia and Egypt. I do not believe this. I wrote about my predictions today. I've not read it before my writing I just stumbled upon it.